M S Baburaj – S Janaki … Were they born for each other or were they born to gift us many nostalgic memories..! It was Babukka who could extract nectar from golden string like young vocals of SJ to fullest. If Janaki amma had anything to share about Baburaj sir, it is pure admiration. She becomes so perfectly nostalgic when ever any one brings the topic of Baburaj sir before her.. How could she not be..! Just look at the melodies that came from this combination…This combination that started around 1962 lasted till 1978 churning out melodies every single year.Just in 1967, Babukka created many ‘Janaki’ centric albums like ‘Anweshichu Kandethiyilla’, ‘Iruttinte Aathmaavu’ (SJ being only playback singer in entire album), ‘Pareeksha’, Karutha Rathrikal’ etc.. This article is a detailed study of those golden melodies.. It was a Meera bhajan ‘Main toh Gunguroo’ that Janaki first sang to Baburaj. But, It must have been immortal ‘Thaliritta Kinakal than’ where Baburaj discovered the genius called ‘Janaki’ and would make her choice for many of his creations to be made in female voice from then! With success of all 4 songs from ‘Bhargavi Nilayam’, their combination gained higher commercial success..! Janaki amma would sing his melodies with all of her heart and soul and thus came gems like ‘Suryakanthi’, ‘Eeranuduthukondambaram’, ‘oru Kochu Swapanthin’.. He was extremely proficinet in creating Hindusthani style songs without loosing flavor of Malayalam .. ‘Avidunen ganam kelkan’, ‘Aardhikayude pooja kusumam’, ‘Thane Thirinjum maranjum’ are such ‘Ghazalish’ classics he created in voice of young SJ. Even after giving such gems, their combination was not restricted to Hindusthani style. In fact songs like ‘Anzana kannezhuthi’, ‘Vaakacharthu’, ‘Saranam Nin charanam’ etc.. had 100% Carnatic classical music flavor.. Most wonderful factor in their melodies was their ability to bring out 1000 feelings perfectly in a 3 minute song..! ‘Kanmaniye’, ‘Kalindi Thadathile Radha’ etc .. were filled with nothing but pure melancholy and songs like ‘Madhumasa Rathri’, ‘Kannukal Karinkoovala pookkal’, ‘Manasa Sarassil’ were absolutely romantic..! Even though melodies were their forte, they were not being in creating variety of songs like westernised ‘Manase Aswasichu’, Open and Lound ‘Kattaruvi Chilanku katti’ and even sensuous ‘Purushanmarude Gandham’ ..! Devotional classics that came from them were absolutely stunning … If Christian songs like ‘Pavananaam Aattidaya’ and ‘Yesumathave’ are remembered till date, so are Hindu devotionals like ‘Vakacharthu’, ‘Krishna Dayamaya’ etc.. Interestingly this combination which started with a Meera Bhajan ended with another classic on lord Krishna ‘Nee Evide Kanna, Karmukil Varna’..
Another name we simply cannot ignore and is part of the golden trio is P Bhaksaran master. If Babukka was tune and Janaki amma was voice, Bhaskaran master was the words in many of those ever living melodies.. Words fall short to praise his greatness.. Just listen to ‘Iru kanner thullikal’,'Kavilathe kanner kandu’ to know how great his imagination was..! No Malayalam interview of Janaki amma completes without mentioning these songs and praising Baburaj sir and Bhaskaran master..! 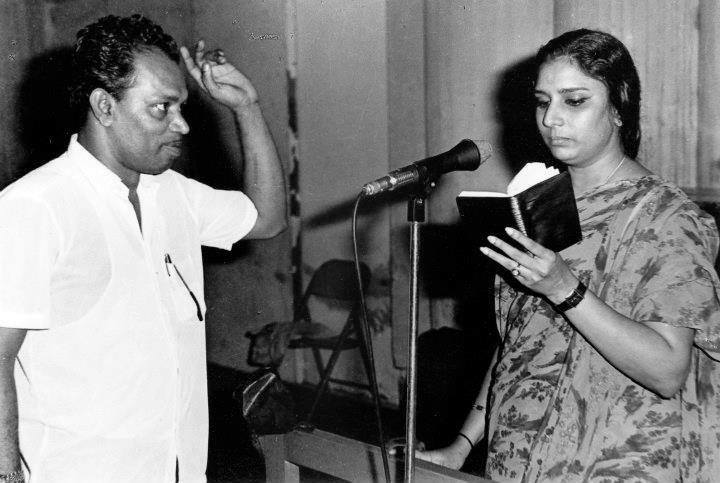 90% of songs Babukka composed for Janaki amma were solos.. However, the duets he created for her were just wonderful! ‘Akale Akale neelakasam’ by KJY-SJ is easily one of the best Malayalam duets ever recorded. ‘Pathiravayailla’ is Babukka’s magic in vocals of KJY-SJ. ‘ Veedayala Villakku venum’ with PBS, ‘Kannonu thurakku deepangale’ with P Leela, ‘Pandu nammal kanditilla’ with B Vasantha, ‘Manimukile’ with AK Sukumaran are few other memorable duets.. In terms of numbers, Janaki amma sang more songs to many other genius composers.. but when ever you discuss Janaki amma’s Malayalam songs, first song that comes is Baburaj … Their music just proves the fact that ‘Music cannot be measured’. This article for sure cannot do any justice to their musical offerings as the works they did together cannot be described, they are just meant to be experienced ..!! Still, this is a sincere effort to place their classics in a single place for convenience of their admirers..
Babukka, We love you, love you and will love for ever! !